The plum-headed parakeet is a medium-sized parrot of striking beauty. This Asian parrot can be a good pet, as it is less aggressive and possessive than some other parrot species and it gets along well with others. It is less demanding of an owner's time than many other parrots, but it still needs regular interaction in order to remain socialized. The plum-headed parakeet is also known as the plum-headed parrot. Plum-headed parakeets hail from India, Pakistan, Sri Lanka, and Bangladesh. They thrive in the woodlands and forested areas, where they make the trees their habitat. 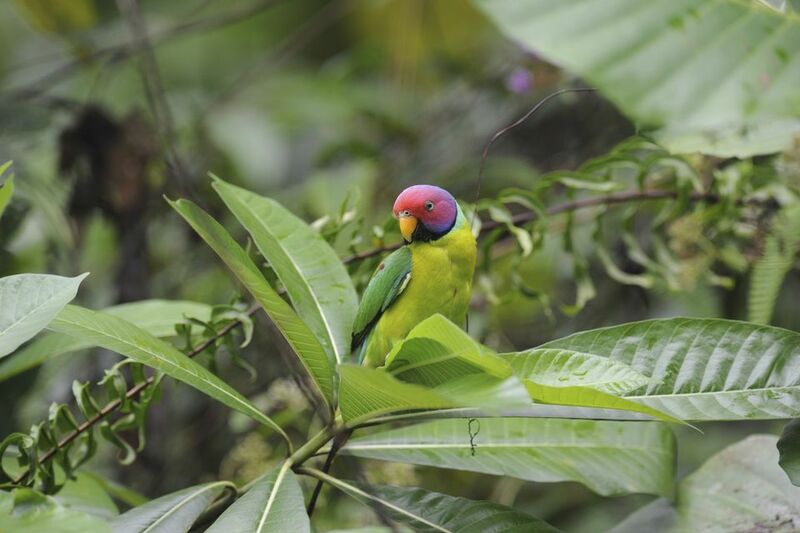 Escaped pet plum-headed parakeets have been reported surviving in a variety of climates around the world, sometimes establishing small breeding populations. A variation of this species, the so-called intermediate parakeet (Psittacua intermidia) is thought to be a hybrid between the plumb-headed and the Slaty-headed parakeet. Although wild numbers of this bird are gradually dwindling due to habitat loss—mostly due to clear-cutting of forests—plum-headed parakeets thrive throughout India and surrounding lands, and they are not considered threatened. The plum-headed parakeet is a medium-sized parrot that typically reaches lengths of up to 12 inches long from the beak to the tip of the tail, although a good deal of that length can be attributed to the long, slender tail feathers. Mature birds weigh 2.3 to 2.8 ounces. Like many members of the parrot family, plum-headed parakeets can live quite a long time. In captivity, the average lifespan is usually between 15 and 20 years, although many birds are reported to live 30 years or more when properly cared for. Plum-headed parakeets are generally gentle, social, and affectionate birds to their owners, although they can be somewhat stand-offish with strangers. They are relatively quiet for a parrot, so they may be a good choice for those bird owners who live in apartments or other housing situations that place them in close proximity to neighbors. When hand-fed as babies, plum-headed parakeets can become very tame and will bond strongly with their owners. This bird is less demanding of an owner's time than many parrots, with a streak of independence. However, regular interaction is still necessary to maintain the human bonding. Many of these birds—especially the males—are good talkers. The chattering that begins at about 6 to 8 months of age may give way to coherent mimicry very soon if an owner is willing to talk regularly to the bird. This is not a universal skill, however, and there are some birds that never exhibit this talent. It is important for those who do not have experience with Psittacula species to understand that many of these birds will go through a bluffing phase during their adolescence. This is strictly hormone-related, and should not be taken as an indication of how the bird's personality will be once it reaches maturity. Birds that are handled daily will achieve the greatest levels of tameness and bonding with their owners. Plum-headed parakeets are a dimorphic species, so it is relatively easy to tell mature males and females apart by the color variants of their plumage. The body of both sexes is primarily green, with varying shades occurring on the breast, abdomen, back, and wings. Males have purplish-red heads that are outlined by a black ring around the neck. Females exhibit blue-gray feathers on their heads and lack the black neck stripe. Instead, many of them have yellow-tinged feathers around their necks. Owners interested in a plumb-headed parakeet should always check with rescue organizations and pet adoption agencies. Plumb-headed parakeets are a common pet, and orphaned birds may be available. Some aviary pet stores may sell this bird, although prospective owners will more likely need to seek out a breeder. Because it has such a long tail, a plum-headed parakeet is best suited to a fairly large cage. A cage with a 24 x 36-inch footprint and 36 inches in height is a minimum requirement. Bar spacing should be no more than 1/2 inch. Include a separate play gym containing toys within the cage, and another play gym separate from the cage for exercise periods. If you are keeping a pair of birds, provide them with a larger aviary enclosure. In an aviary setting, the plumb-headed is one of the few parrots that will happily coexist with non-competing birds, such as finches. Like any parrot, the plum-headed parakeet needs some time each day outside the cage, but unlike other, more demanding parrots, the plum-headed is not a cuddler who needs constant petting and hands-on play. Instead, it will likely be content to merely sit on your shoulder and "talk" with you. Without this level of daily interaction, though, the bird may withdraw and even become somewhat wild again. In the wild, this bird feeds mostly on fruit and seeds. Like other parrots, plum-headed parakeets do best in captivity when they are fed a diet consisting of a high-quality seed and pellet mix, supplemented daily with fresh, bird-safe fruits and vegetables. These birds enjoy variety in their diets, so be sure to experiment with foods like sprouts, leafy greens, berries, and even peppers. Birds do not have the ability to pick up on "hot" flavors like humans do, so many of them enjoy picking apart spicy peppers to get at the seeds inside. Plum-headed parakeets are very active birds in the wild, so in captivity, they must be provided with an area to exercise and play in. These birds should be allowed a minimum of 3 to 4 hours outside the cage each day, in a safe, bird-proofed play area. They should be supervised by their owners during this time to prevent accidents and injuries. This time for exercise and interaction time is critical for keeping a plum-headed parakeet healthy and well socialized. Otherwise, check out our other parrot bird species profiles.